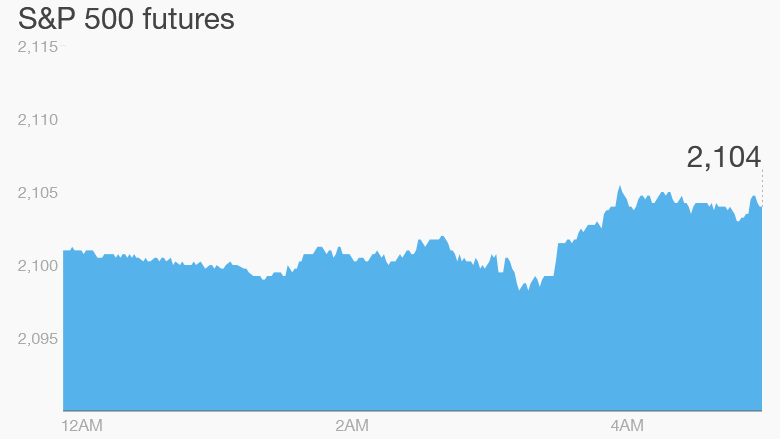 All signs are pointing to a positive day in the markets. U.S. stock futures are up and bond prices are rising after a sell-off on Tuesday. 1. Earnings: Ralph Lauren (RL) and Macy's (M) are reporting ahead of the open. Cisco (CSCO), J.C. Penney (JCP) and Shake Shack (SHAK) will report after the close. 2. Eurozone economy perks up: New data shows the eurozone economy grew by 1% in the first quarter compared to the same period in 2014. Within the 19 nations, there were some standouts and laggards: Growth in Spain was robust, and Italy emerged from recession. Greece returned to recession. 3. More economic data: Bank of England Governor Mark Carney is speaking in London about the state of the U.K. economy and inflation. Markets are watching for clues about when the bank may begin to raise interest rates. U.K. data showed unemployment dipped to 5.5% in the first quarter. In the U.S., the government will report monthly retail sales numbers at 8:30 a.m. ET. 4. Another airbag recall: Toyota (TM) and Nissan (NSANF) have recalled another 6.56 million cars equipped with possibly faulty airbags manufactured by Japan-based Takata (TKTDY). Shares in both carmakers fell 1%. 5. International markets overview: European markets are rising in early trading, while Asian markets mostly closed the day with gains. Oil prices are rising by about 1% to trade near $61.50 per barrel. 6. Tuesday market recap: On Tuesday, stock markets were looking rough in the morning. But the day didn't end too badly. The Dow Jones industrial average lost 37 points, the S&P 500 dipped by 0.3% and the Nasdaq slid 0.4%.